Patagonia Under Siege: Farmed Pacific salmon invade Atlantic in Chile & Argentina Patagonia - salmon-ranching experiments in the 1980s gone awry. 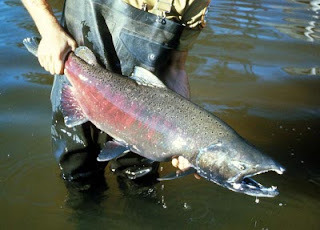 Farmed Pacific salmon invade Atlantic in Chile & Argentina Patagonia - salmon-ranching experiments in the 1980s gone awry. A study published in a recent issue of the journal Conservation Biology has confirmed that introduced Pacific salmon are successfully invading the Atlantic.